At approximately 11:40 p.m. last night, Anaheim Fire & Rescue received multiple calls of a garage fire in the 2000 block of W. Blue Violet Court. Upon arrival, fire personnel found the garage of a two story detached condominium was fully involved and the fire had spread to the living quarters of the structure. Approximately 24 firefighters from Anaheim Fire & Rescue and the Orange County Fire Authority attacked the fire while defending the surrounding residences. The fire was extinguished within 20 minutes. Fire investigators found evidence to indicate the condo was being used as an indoor marijuana grow as well as a sophisticated THC (Tetrahydrocannabinol) extraction site, commonly known as a Butane Honey Oil extraction (BHO). 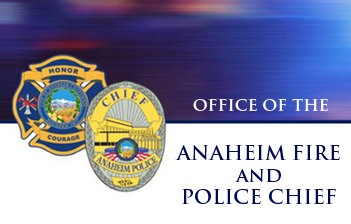 Anaheim Police investigators responded and are working in partnership with Fire investigators. BHO extraction is a volatile and dangerous process in which explosive gasses are heated in an effort to extract the THC from the cannabis leaves. BHO labs have been on the rise in California over the past several years and are a serious threat to public safety, so much so that Governor Brown signed SB 212 into law on August 7, 2015. This bill went into law effective January 1, 2016 and makes it an aggravated felony to manufacture hash oil within 300 feet of an occupied residence or structure. The cause of the fire is still under investigation. It is very fortunate nobody was injured or killed and no uninvolved residences were destroyed. The condo in which the fire initiated is heavily damaged with an estimated structural loss of $450,000 and $20,000 in content loss. The condominium was unoccupied when emergency personnel arrived. An investigation is underway to locate the individual(s) who were in control of the property. We continue to ask the public to report suspicious activity to local law enforcement. Anyone with information regarding this case is asked to call Crime Stoppers at (855) TIP-OCCS, or by email at www.occrimestopers.org. Information leading to an arrest and conviction may result in a reward up to $1000.